Instructor User Guide GradebookHow are grades calculated in Gradebook? 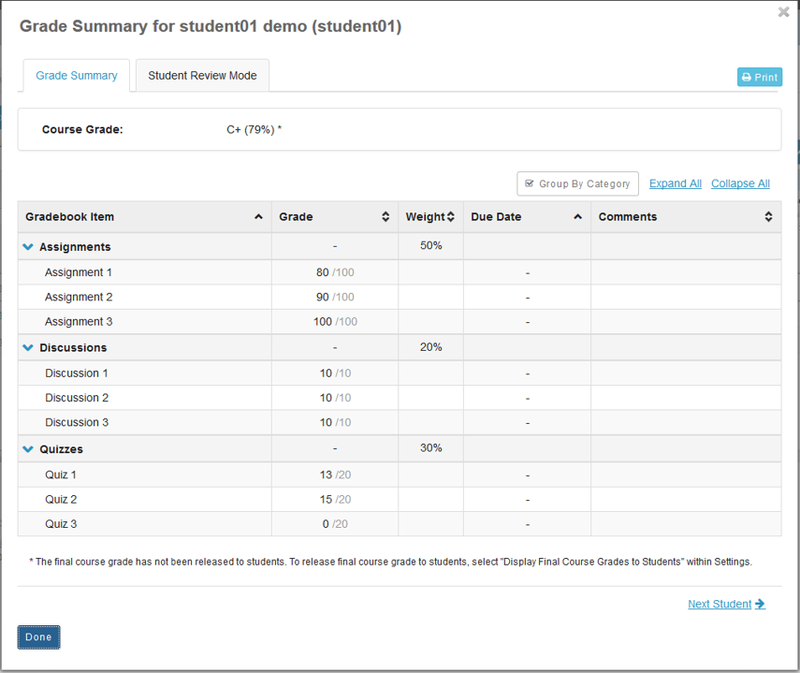 Gradebook automatically calculates a course grade based on the number of points scored out of the total points submitted (i.e., a running grade). Ungraded items will not be included in the course grade calculation, so the course grade will not necessarily reflect the student's true score. To include ungraded items in the course grade calculation, you need to enter a 0 (zero) for those items. To exclude a gradebook item from the course grade, you can edit the gradebook item and deselect Include this item in course grade calculations. The score for that item will appear in parentheses to indicate that it is not included in the course grade calculation. Extra credit points are excluded from the total possible points available, but included in student grade calculations for points awarded. 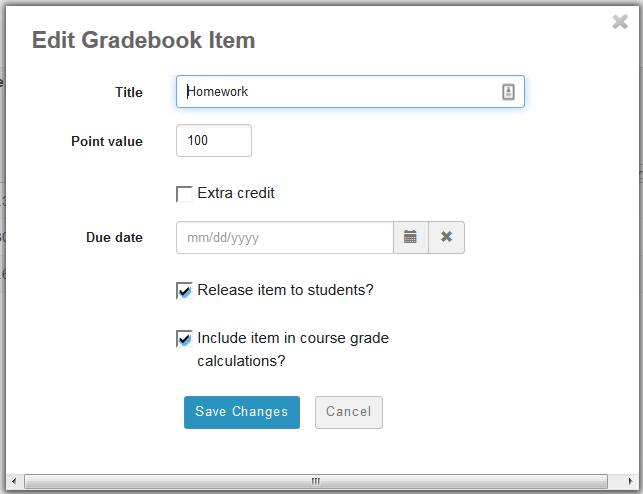 See How does extra credit work in Gradebook? for more information on extra credit gradebook items and categories. Note: Students can't see their grades for an item unless you select Release this item to students when editing the gradebook item. If your gradebook does not have weighted categories, the calculation is relatively simple. The Course Grade is the total number of points awarded divided by the total points possible. Let's look at an example of this below. Assignment is worth 50 points. In this example, the Assignment has a total points possible of 50 points. Only Assignments has been graded. Zoom: Only Assignments has been graded. Notice the scores for each student. student01 has a course grade of 70%. This grade is based on 35 out of 50 points on Assignment. student02 has a course grade of 80%. This grade is based on 40 out of 50 points on Assignment. student03 has a course grade of 90%. This grade is based on 45 out of 50 points on Assignment. The Homework and Quiz are not calculated in the course grade since they have not been assigned any scores. Homework is worth 100 points. Homework has now been graded. Zoom: Homework has now been graded. Cumulative grades after Homework is graded. Zoom: Cumulative grades after Homework is graded. Now, notice the updated course grades for each student. The scores for Assignment and Homework are added together, and then they are divided by the total possible points for those two items combined. Not all Quizzes have been submitted. Zoom: Not all Quizzes have been submitted. Only the grades that have been entered are calculated. Student01 has not submitted a quiz, so his grade is still (90 + 35) / 150 or 83.33%. The student did not submit the quiz. Zoom: The student did not submit the quiz. On the other hand, if you have weighted categories in your gradebook, the calculation is a little more complex. First, all of the items within each category are averaged, taking the total points awarded within the category, and dividing that by the total possible points within the category. Then, all category averages are multiplied by the category weighting and added together to determine the final score. 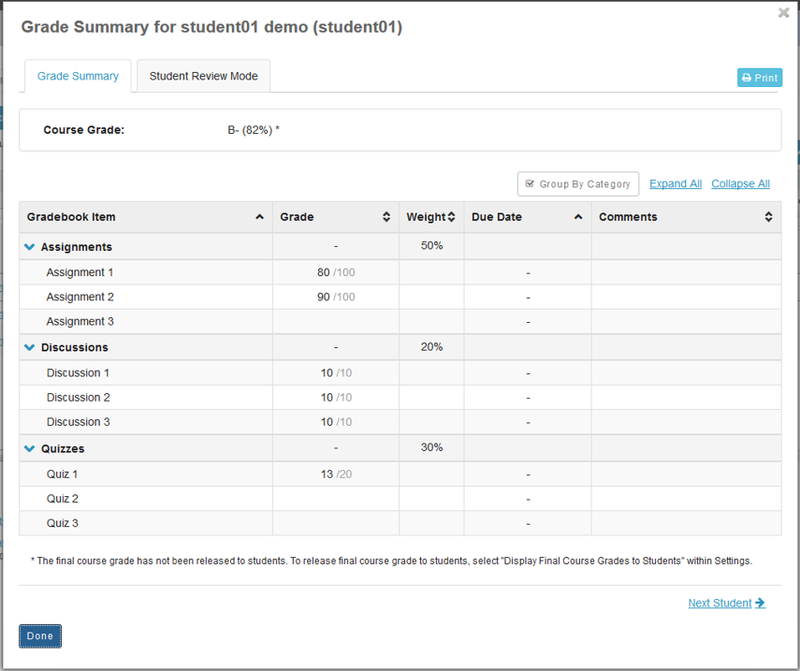 The example below shows the grade for an individual student in a weighted gradebook with three categories: Assignments (50% of course grade), Discussions (20% of course grade), and Quizzes (30% of course grade). Student01 course grade with ungraded items. Zoom: Student01 course grade with ungraded items. Demostudent01 with no ungraded items. Zoom: Demostudent01 with no ungraded items. Setting all ungraded items to zero. 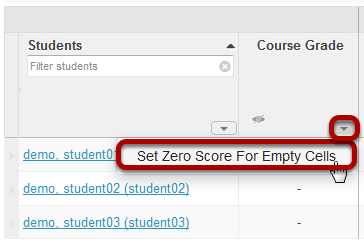 If you would like to enter zeros for all ungraded items in the course, select the down arrow in the Course Grades column and then select the Set Zero Score for Empty Cells option to update all items at once. Note: This option should be used with caution, as it will enter a zero for any items not yet scored. It is best used at the end of the term after all submitted work has been graded.